Cowan's Fine Books and Manuscripts: Timed Auction features a fine collection of rare and collectible first editions, illustrated volumes, along with maps, manuscripts and autographs. One of the highlights is a copy of Barry Moser’s “Pennyroyal Bible.” There is an extensive collection of Civil War volumes – battle descriptions, regimental histories, Generals’ memoirs, and military tactics. Illustrated Natural History volumes include Mollusca, birds, along with nests and eggs, quadrupeds, orchids and wild flowers. 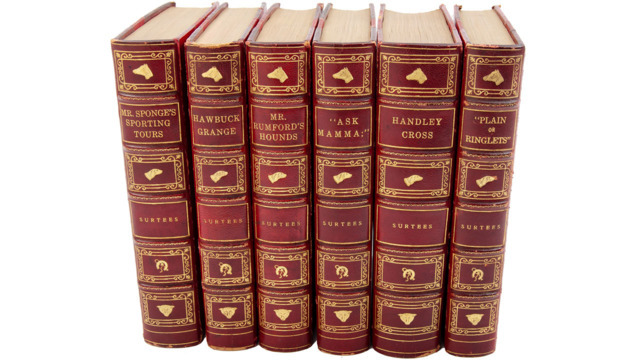 Several volumes illustrate art, design and architecture, from doors to furniture, plus examples in the English “Royal Residences,” “Mansions of England” and “County Seats of Great Britain and Ireland.” Autographs include Rutherford B. Hayes, FDR, Huey P. Long, J. Edgar Hoover, J.C. Penney, Dwight Eisenhower, John Philip Sousa, Katharine Hepburn and H.B. Stowe. An archive of letters highlights life in Newburyport, MA in the first quarter of the 19th century.